This is the third of a series of 5 posts expanding on questions people have asked me when discussing my work and artistic experiences. They are published as part of the exploration of my creative life. Every artist must respond to something in their world that propels their work forward and adds a counterpoint to the existing culture. For me that difference is the contrast between digital reality and personally-experienced reality. Digital reality is obvious. It is content which is shown on a computer, tablet, cell phone, or TV. It’s composed and presented to influence the way we think, what we purchase, or to provide entertainment. So what is the experience of the reality in front of me, where I experience nature with all its beauty, complexity, and unpredictability? Science and technology seem to transcend the experience of the individual and show the world and universe more clearly than we can personally see it. That is simply because we need to find meaning and significance to what we see, hear, and feel. Even those of great scientific thought are bound by the need to make sense and establish meaning to their thoughts and work. No one is free of this need and necessity. I have always liked the story of one boy who came across numerous starfish washed ashore by a great storm. An adult found him throwing one starfish after another back into the sea. The adult said, "You cannot make a difference to all these starfish washed ashore." To which the young boy responded, "Yes, but I can for this one," as he threw another starfish back into the sea. So it is with individual experience and art. As I throw my art into the sea of life, what is the difference, what meaning can my art make? What is unique about my work is that I strive to share the significance of my experience in the natural world. Our social world seems to be moving toward an experience where life is primarily seen in front of a screen of some sort. Do we lose our humanness in this process? Do we become brains out of touch with our bodies? My art does not convey my experience in the society in which we earn our livings and share social significance with each other. My work is the expression of one person's experience going back to the roots of our lives on this planet and sharing it using the latest technology. It is a blend of the primal with the cerebral. My work is presenting my cerebral-ness, as well of the rest of my body, into nature...at sunset, sunrise, nighttime, and the rest of time. It is taking my body with its all-ness into the natural world and asking the simple question of all of me, "What am I experiencing at this time?" It is an attempt to ask those viewing my work to remember and experience their basic experiences in nature and life...and not in front of a screen. So, what does this image mean to you? (Genesis 1:6-10) where the heavens and earth are separated. This is the creation of the world where the light separates the firmaments. It spells for me the creation of life...my life. For others who have spoken to me about this piece, it is the calling of the light in the darkness. It is the light that calls beyond this world. It is the light that transcends the darkness of this world and even of death. So it is. What is shown is shared. What is shared is for you only and only for those who see it as meaningful. 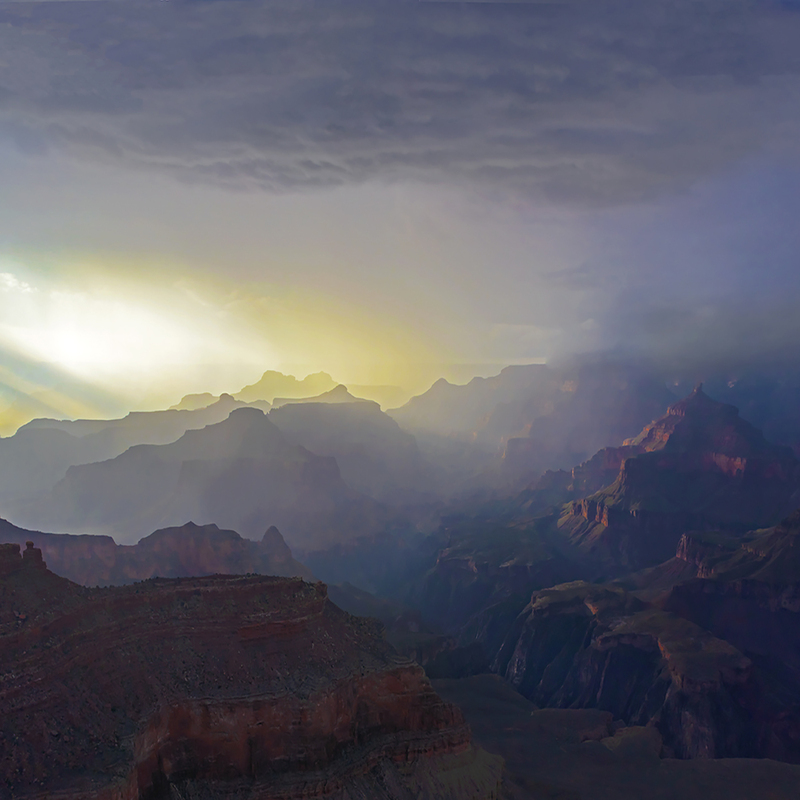 Posted in Thoughts, Experiences and tagged Grand Canyon, evening, Creation. ← Previous: Questions about my work #2 - Why landscape photography? Questions about my work #4 _ Why do you care so much about personal experience?